Many items on this page are for sale or similar can be made to order. Made from real shell, copper and coloured wire and glass beads, this Natural Clam Jewel case was made for a good friends teenage daughter for her birthday. Being a big fan of Alice in Wonderland and all things Mad Hatter, I made a couple of Mad Hatter hats. This one was made for myself. One day, I hope to make some more. A wide range are available for purchase. Luke and I completely restored this rocking horse, sanding it back, smoothing it, making new rocker and iron frames for the horse to sit on. 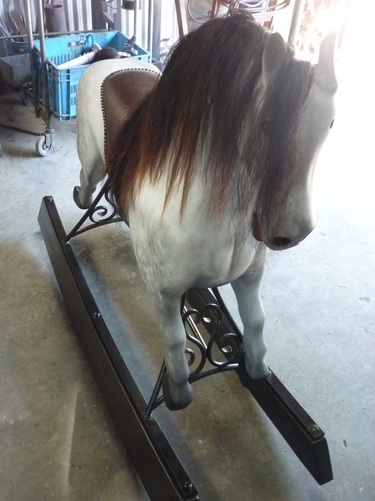 The mane is real horse mane with an upholstered saddle and a dapple paint finish. We are both very happy with the finished product. Made to order, these canvases are a great idea for any special event. Sometimes you need to make the time to design and create items to showcase what you can do. These are 2 of those pieces happily on display @ House of Hedwig in Montville. Below are some amazing Glass Sculptures made by Tina Cooper as part of her 'Cornucopia' Exhibition. I was given the opportunity to combine my iron work with her glass work and this is the final product. We were both very happy with the results.